V&A museum, London, 6th to 10th May 2016. 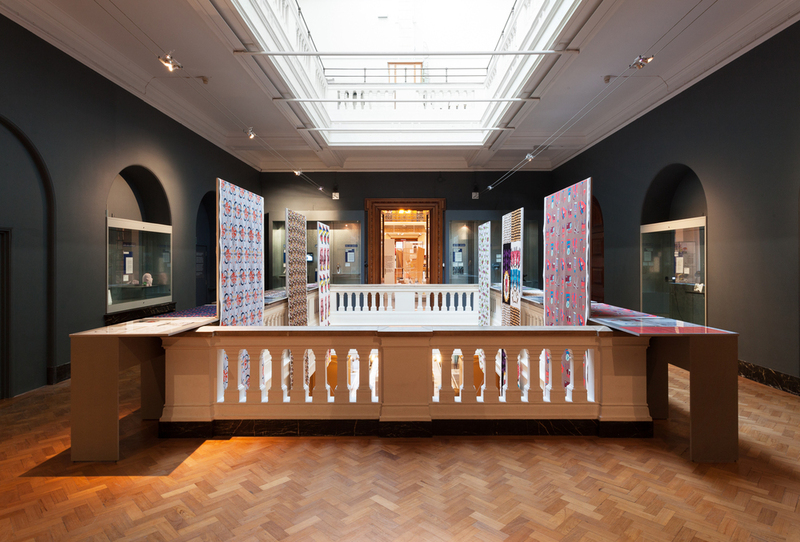 An installation designed and made to showcase fabric designs inspired by the V&A collection by 6 artists working with Intoart and designers Holly Fulton & James Lambert. Digital print patterns on 1.5m wide fabric bolts were displayed from a roll at the base of the display, across a horizontal surface, up a cantilevering vertical panel and dropping down into the light well in the centre of the space. The artist's preparatory drawings and reference material was displayed on an adjacent table which also cantilevered over the stone balustrade.